As I’ve mentioned before, many of the plants and bushes and trees on this blog have been photographed alongside what used to be a railway line. In some places it is now earth, or grass or stony ground. 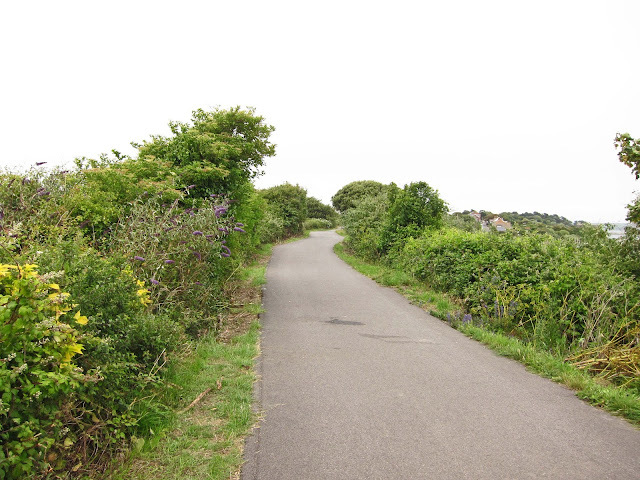 In others it has been tarmacked and turned into a comfortable footpath and cycleway. More and more people are travelling along it; in and out of town; or taking it in as part of the Southwest Coast Path which runs the 630 miles from Poole in Dorset to Minehead in Somerset. This is good. Of course it is; except I preferred it when hardly anyone went that way. Last Saturday, I was walking along this section with a couple of friends when we found ourselves almost in step a few yards behind a man with a small, brown, broad shouldered, fighty-type of dog. 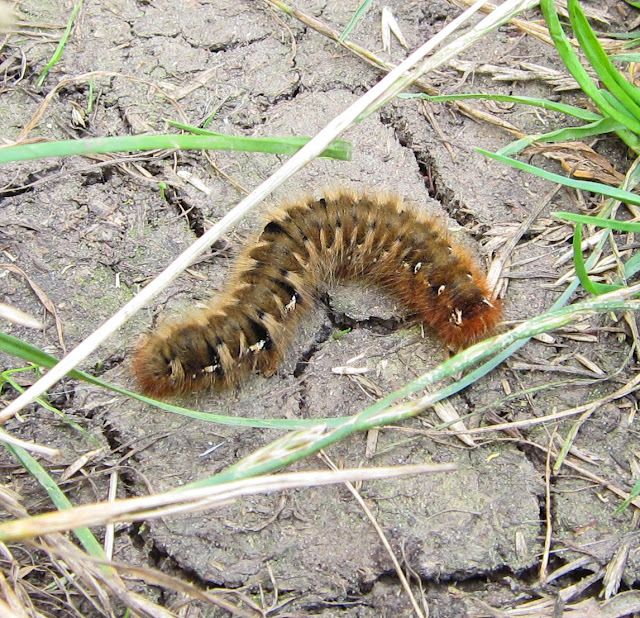 blazing down and caterpillars are sun-bathing on the path. - all in just this one glimpse. I don’t usually like this kind of dog. Their owners generally insist they are friendly; but, if they bite, their jaws lock and they don’t let go. Sometimes they are lethal. Sometimes they frighten me. Always I am wary. This dog was a sort of exception. Whereas most dogs like this charge along on a long leash or run anxiously loose, this was well trained. It was not on a lead but when any other dog came by, the owner called to it and it walked by him on the side away from potential friendliness or confrontation until the passing dog had walked on to a safe distance. There was no barking, no chasing and sniffing. It was all very orderly. It was also funny. Once the command had run out of purpose, the dog would trot round behind its owner in a kind of peep-o game. “Where have you gone?” the man would ask, looking about - but the dog was always somewhere in the near circumference of his heels. After a while, we were distracted by caterpillars - bright green and yellow ones - and lots. When I am out with family or friends, they get annoyed if I spend too much time taking photographs of leaves and trees and tiny, familiar-but-interesting-to-me plants. The camera has only to appear and groaning begins. In a post called 'One thing I have realised ', Jen at Muddy Boot Dreams amplifies on a comment I'd made after reading a post called 'What to do with all those pictures?'. I'd admitted that I don’t pay enough attention to snap-style photos . . . people, places, events; when I am old, they are the pictures I will treasure - not twigs here and pebbles there. None the less, I find it hard to take pictures of people. For one thing, I am not very good at it. For another, I shy away from taking portraits without permission. And I don’t like forced smiles, funny faces or set expressions either - so pictures for posterity are neglected . . . So, there we were, looking down at the ground in a communal kind of way. “Here’s a caterpillar. Here’s one. Here’s one. And another!” Until, in the end, I could bear it no longer. Out came my camera. We’d forgotten the dog. 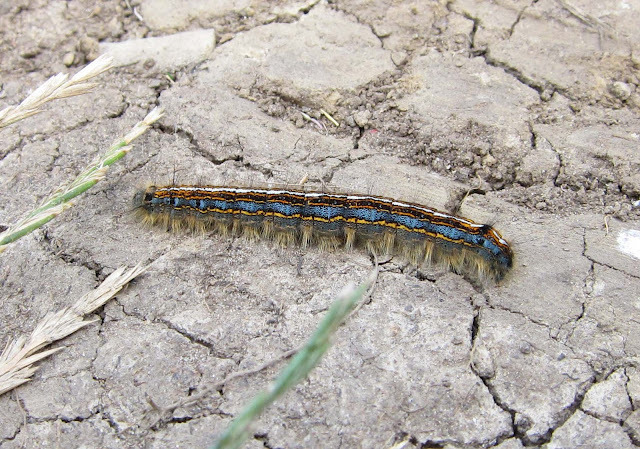 The call of its owner to step aside from the path only gelled into sense when the dog trotted up and sat very goodly at my feet, right between my toes, right on top of the caterpillar I was focusing on. I don’t know why he had chosen that moment to switch allegiance, or put himself in my confidence. But, there he was, happily sitting on ‘my’ caterpillar. I gave him a stroke (I think he was a he) called a friendly remark to the owner - and put my camera back in its bag. Yesterday, I went for a walk on a track which leads off the old railway line - where there is nothing between it and the sea except eroded cliff. See what I mean about yesterday's blueness? But even then it was raining from time to time. Surprising drops falling from an apparently cloudy sky. The playground noise of happy children floated across the water. 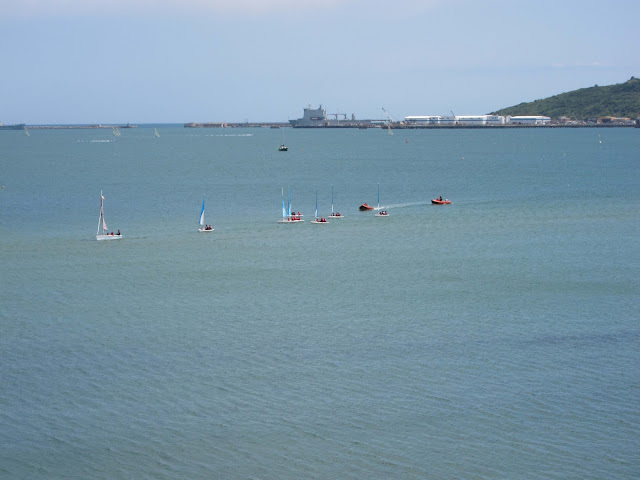 A flotilla of training boats was speeding towards the sailing club; experts leading the way, novices in the middle - and extra adults following for safety behind them. But there were no green and yellow caterpillars. Two other kinds though. They seemed to be sun-bathing on the parched, hard and cracked earth. This is a link to see what the Lackey will look like when it's a moth. A short while back Laura at Patio Patch (in relation to the post about a walk to the sea and back) asked what we would have come across if we had gone further. What’s there depends on the tide so I’m beginning a series of posts about what you would see if you went to a higher path (parallel to the rocks and little coves) so you can look down without getting your feet wet. This is the first of these posts. I love your style of writing! And I sympathise with you on the attitudes of family to the appearance of the camera. Fortunately, one of my daughters is as fanatical about photography as I am (Is it a coincidence that she is also a blogger? ), so I do get some support. Those caterpillars are really spectacular. I can see why you didn't want to miss the opportunity to photograph them. Someone had trained that dog to stop you taking photos (!) so am glad you managed another day. Love the caterpillars -reminds me of my childhood when I would spends hours hunting for them (and how well informed you are as to names etc). 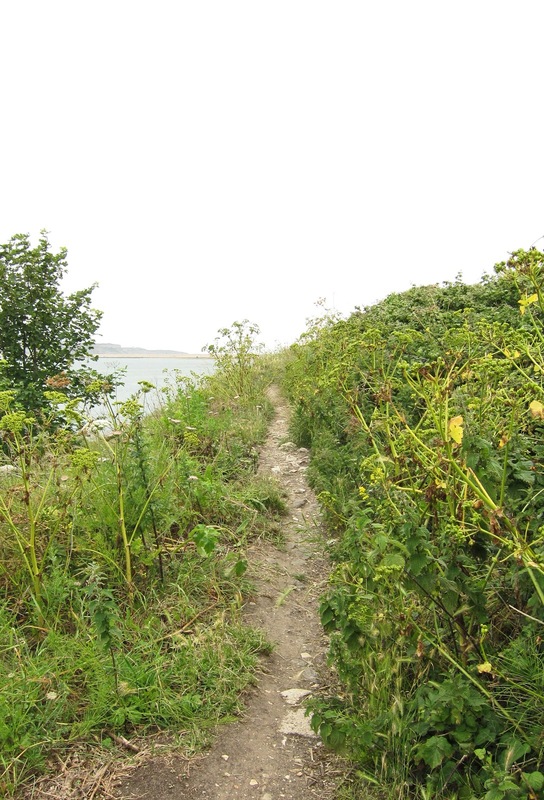 Great to hear that you are going to continue on your sea walk - your walkabout images and narrative are pure enjoyment. I love it when my Google Reader tells me that there is a post by you. I feel the same way as you about dogs, not afraid of them exactly but wary. I don't like them as much as I do cats. I enjoyed your walk, as usual, thank you. Your ex-railway line looks really interesting and I know exactly what you mean about preferring to have these paths to yourself! The Lackey caterpillar is rather pretty and I've always liked the furry kind. I don't often see caterpillars at all though. Hello Patio Patch - and thank you. Please don't think I am knowledgeable about caterpillars though. I hardly know anything about anything. 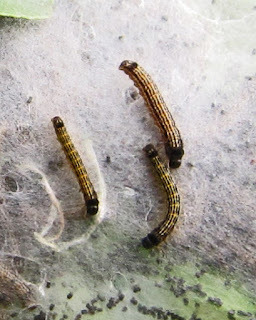 I was able to identify these with the help of Ispot. If you aren't already familiar with it - do check it out. It is absolutely brilliant when it comes to help with IDs and our contributions are helping to create a national photographic database of British flora and fauna. Hello Elephant's Eye. It is always good to have you along in your armchair! Hello Toffee Apple. I'm pleased you enjoy the posts - and glad when you leave comments to mark your visits. Hello Rowan. I used to come along this path from time to time when there was nothing but rough ground where the rails and sleepers had been lifted. I'm not sure if the stones under-foot were just stones or what was left of the ballast but they were certainly uncomfortable to walk on. The tarmacking of the railway provided a direct and easily walked route into town. No-were near as many people would walk if they had to go along the main road with all its ups and downs and traffic.